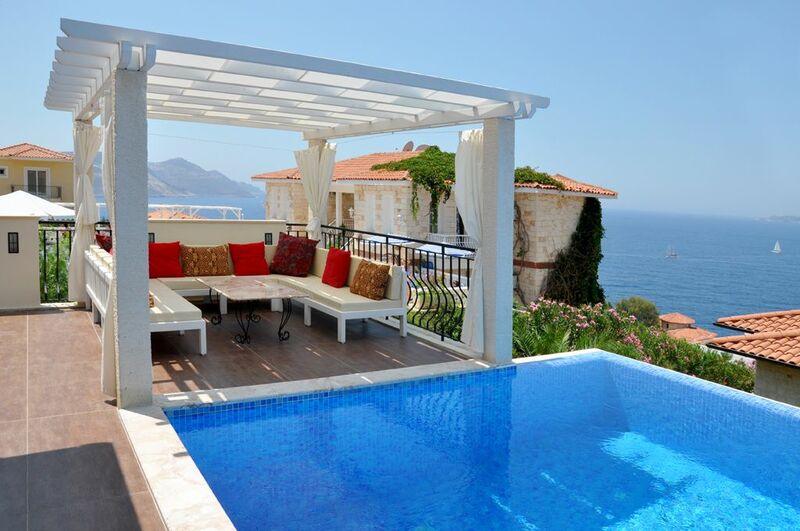 This newly built & furbished villa is located on one of the most natural and charming coasts on the Mediterranean sea by the Turkish harbour town of Kas. Situated only 300m from the sea, the villa is located on the exclusive Kas peninsula which is about 8 mins drive or bus/taxi ride from the town. Overlooking the Greek island of Meis on one side and Taurus mountain on the other, the peninsula offers ideal “chill out” holiday venue with breathtaking views of the Mediterranean sea. All 4 bedrooms are air-conditioned as well as 2 air conditioning units in the living area, the 200m² villa is beautifully designed with a good size private pool. Furnished to a highest western standard design, all 4 bedrooms are fitted with comfortable and yet stylishly furnished beds and fitted large oak wardrobes & dressing table with a chair and additional ceiling fan in each room. It has 2 double bedrooms with king size beds upstairs which look out to a balcony with stunning sea views, whilst there are 1 large twin bedroom which opens out to the pool terrace and a further twin bedroom near the front entrance which may be suitable for children on the ground level. It is quipped with what you would expect from a luxury villa. There are 3 bathrooms, 2 are en suit, of which one has a bath and both have walk in shower cubicle with separate over head drench shower and a hand held shower head, another bathroom is on the ground floor also has a over head shower in a cubicle & a toilet. All bathrooms have 2 hand basins. All guests are provided with soft fluffy white towels which are changed weekly and also additional beach towel each. A fully fitted open plan kitchen has everything one wishes to have in a kitchen including the American style fridge/freezer, all integrally fitted dishwasher, oven & microwave oven, the patio door opens out to a terrace where you can have outdoor dining at the comfortable luxury dining table & chairs. The dramatically designed open plan lounge has 2 staircases with gallery landing and luxury sitting / dining area with French doors that opens out to a large sun terrace & pool for superb outdoor living, as well as a large satellite TV & DVD player and iphone/mp3 music station. Further sitting furniture are on the terrace, perfect for alfresco living with ceiling fan under the terrace roof where you can just enjoy the passing yachts or relax around comfortable sofas & sunbeds or enjoy dipping in the crystal clear swimming pool. The cabana style outdoor pergola which gives an additional shades is an ideal place where your family & friends gather around to have a drink or two or watch the sun go down. As well as plentiful sitting area, there are 6 quality wooden sunbeds with pillowed mattresses where you can soak up the sun should you wish or simply sit there under sun umbrellas. There are other facilities like gas BBQ & outdoor shower and washing machine & tumble drier tucked away in a cupboard on ground floor. Children's cot & high chair are also provided should you need one. The pool & garden are tended by our caretaker everyday, in order to maintain the pool & terrace spotless. My name is Jessica Leech, I run a business in UK. I travel a lot around the world on business and this has given me the understanding that the place you stay should be comfortable and yet practical which is essential for the travelers & holiday makers.
. The view from the villa is a joy to be had but one thing I enjoy the most every day is watching the beautiful sunset over the sea in the evening with a chilled drink in hand and lovely jasmine scent around the terrace, it never tires me. We provide a welcome pack and weekly cleaning free of charge, our caretaker will meet & greet you when you arrive and see you off when you leave. He also brings free fresh bread each morning, to save you going out. toilet, shower, bidet, There are twin basin the the bathroom. The shower cubicles are walk in shower, the showers are drench over head shower with high pressured water, and foot water tap & hand held shower head. We have instant hot water system, therefore, you never be short of hot water no matter how much water you are using. All bedrooms have one each room and there are 2 in the living room area. Our air conditioning units can be used as reversible heating unit. High quality base sheet & piquet sheets are provided for your comforts and changed weekly by our cleaner. It is inside the downstairs cupboard with basic washing powder provided when you arrive. It may not be needed for summer months, but lovely to have it when you are in a hurry. It is also inside downstairs cupboard. Mostly for decoration purpose but working model. There is tiled roofed car port just outside the villa which leads to the front garden with a few steps down. There is a front gate with just 1 step if you have difficulty walking. Bath towels are luxury soft bamboo towels, 1 bath towel & 1 hand towel and 1 beach towel is provided per person and changed weekly by our cleaner. Spectacular open plan living room, it has unique design features like double stair cases and gallery landing with high wooden beamed ceiling. It opens out to the pool terrace through French door. American fridge / freezer with water dispenser. The water is fully filtered and treated. Induction hop. All pans provided are for induction cooker. Bean to coffee machine is available, you can choose to use it either from the beans or ground coffee. The toaster is 4 slot toaster for a busy morning catering. There are basic amount of dishwasher tablets, washing powder to start with. The water is straight from the drinking water tap as we have a special filter system installed for your convenience. There are more than enough of dishes, plates, oven wares for family of 8. The travertine floored long & wide kitchen is perfect for a family, there are everything you ever need on your holiday. Most fitted appliances are Bosch brand except the induction cooker. There are 2 dining areas, one is inside the living room and the other is just outside kitchen under the covered roof. 8 people can be seated comfortably. There are numbers of channels to choose from. There are some DVD's available but we recommend that you bring your own to your taste. Some selection of books available. a few board games available. Many fruit & lovely smelling bushes are planted around the villa. 2 of the upstairs rooms have balconies where you can just walk out through the French doors, both has a spectacular sea views. Boat hire could be available from the Marina. Slip resistant floored terrace has sofas, cabanas & dining table & chairs. It is a great place for Alfresco living and also a wonderful place top watch the sunset. There are some tennis courts around Kas. There are a few steps to consider when entering the villa. Not suitable for upstairs room. A good size of 35CBM pool is maintained daily. We recommend all our guests to have shower before entering the pool for a good water quality, the shower is located on the terrace. There are a few places with spa facilities, the information is in the villa. There are many tour operators who offer variety of sports, leisure & touring excursions should you wish. You can also hire a private boats for a day or two, all the information are provided in the villa. This is the second time we have holidayed in Kas and both times we have enjoyed our experience of the destination and villas we have stayed in. The first time we visited we did all the touristy things but this time we made more use of the property we stayed in and took it easy. This villa allowed us to do this as we felt so comfortable the minute we walked through the front door. to be greeted by that fantastic view. Jessica was a pleasure to deal with and supplied us with the necessary information needed for our stay in good time so we had no worries. The Peace Hotel which is opposite the villa was a great place for breakfast and the staff were extremely friendly and accommodating We tried a few restaurants listed by Jessica in the villa's information file and have left a note of them in the visitor's book. While in Kas go to Kekova and discover the sunken city, trek through the Saklikent Gorge, step back in time at Xanthos, get a tan on Patara Beach and ost importantly enjoy Kas and its friendly people alongside relaxing in this delightful villa. The property is beautiful. It is really comfortable, well equipped and has stunning views. Staying on the peninsula is a delight with some local beaches and less than a 10 minute drive to Kas. Despite being there in October we still swam in the pool, and the local people, beaches and places to visit were all lovely. The villa is not only well equipped, but the team who look after it are on hand if you need then at all. I am sure we will be back. We have stayed in many villas over the years, but none as special as this one. Truly wonderful. The décor is lovely and it is a real pleasure to cook and eat in the villa, all cutlery, glasses etc., matching which I have often found lacking in other villas. All the rooms are large and airy with wonderful views, as you open the front door, the magnificent view never fails to make you smile. The sunsets are amazing. All in all, a wonderful holiday and a great introduction to Turkey, which is amazing. We hope to return. A perfect retreat in a beautiful location. We had an amazing 10 days in this villa with our family. A beautiful, clean villa with everything you need to have the perfect holiday. The views are spectacular. Jessica, the owner was very easy to deal with. She arranged our pick ups from airport, told us all the best restaurant's to go to, who to book our boat trip with (a must do), even down to which taxi driver to use. All information needed is provided in the villa. All in all probably one of the best holiday's we have had. Role on next year. We had a fantastic week in this lovely villa! We loved everything with it. Highly recommended. Villa Vista is situated in Cukurbag Peninsula and has the most stunning views of sea & the surrounding mountains. The warm Mediterranean Sea is a stones throw in front of you and you can spend many an hour just taking in all the beautiful sights. The sun will shine on the private pool area and wonderfully presented gardens throughout the day until sunset, and a welcoming breeze is occasionally present in the high summer. It has the most wonderful sunset views to enjoy in the evening, just when you are getting ready for dinner with a glass of wine on the comfortable terrace! Explore the cobbled streets mixed with exotic shops & ancient Sarcophagus around Kas town which has many small pebbled beaches or go on a boat trip to secluded bay or try something a bit more energetic-scuba diving, walking the Lycian Way, kayaking, para-gliding ,or drive out to near by ancient ruins which are strewn around Turquoise coast. You can book a trip out of Kas to visit the sunken city of Kekova and ruin at Simena which can be reached by boat, long stretch of sandy beach in Patara and near by ruins, Saklikent gorge & Tlos temple and visit the trout farm for a delicious lunch, St Nicolas church an hour drive away or go down hundreds of steps to reach a small hidden cove of Turquoise green sea & sandy beach at Kaputas and relax the day, and much more. Payment is accepted by bank transfer, Credit card or Paypal. All charges of sending money should be paid at source by both parties.